You are here: Home > Trading FAQs > What is a Stop Loss? 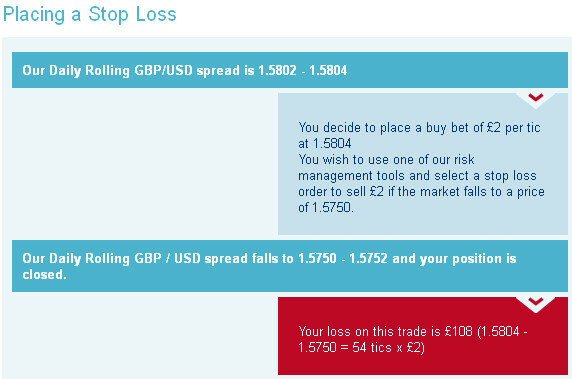 A stop loss order is a trading strategy that will help you reduce some of the risks associated with spread betting. Let’s go back to basics. It is a fact that financial spread betting allows you to potentially magnify your profits, but it also magnifies potential losses too! And, as opposed to traditional shares dealing where your maximum loss is capped to your original investment, with spread betting losses are uncapped and can exceed the initial margin you put down. Spread Betting brokers are aware of this and have developed safety mechanisms to make sure that traders don’t end up racking debt. There are a number of different orders available, with the most common being the stop loss and a guaranteed stop loss. With both normal and guaranteed stops you specify a price at which you would like your spreadbet to be closed out, while the guaranteed stop loss order ensures you get the price you set, this isn’t necessarily the case with a stop loss. A stop is basically an instruction to deal at a less favourable level than the present price. Normally it is used to limit the potential loss on an open spread trade and in this respect is generally referred to as a stop loss. Every time you utilise a stop loss, you are effectively limiting your potential downside on that particular trade to a specific price point. Spread betting being a margin traded product, it is always advisable to use a stop loss to control your risk – in fact stop orders are considered a vital component of risk management and should always be a part of a trading plan. Stops don’t only help you devise a suitable price target but will also help you determine the amount of capital you are willing to trade and risk. Please note, however, that normal stop losses are not guaranteed and even if you set a stop loss price, the spread betting firm may not always be able to execute your stop loss at the exact price you set out initially. In particular in volatile market conditions, standard stops can be susceptible to market gapping. You can, however set a guaranteed stop loss, for which the stop loss level will always be executed when the underlying market reaches your set price, however most spread betting providers charge an extra premium for this. The extra charge usually takes the form of a slightly wider spread, normally costing about 1% of your exposure. In practice, stop levels should also be adjusted so as to lock in profits and so further reduce financial losses which can also lead to the possibility of pyramiding positions and even inverse pyramiding depending on your trading approach. Note that you don’t have to set a limit, although I presume it would depend on your spread betting provider. For instance, City Index don’t set any stop-loss (a stop-loss, not a limit) when you place a trade but Capital Spreads do so automatically (although you can then adjust the stop loss level). You would have to check the small print. It is not always evident but stops can also be used to protect profits. For example, let’s imagine that you bought £5 per point of the Wall Street Index at 10120 and witnessed the index quickly rising up to 10300. You could place a stop order at 10122, thus making sure that you breakeven should the market reverse direction, or better still you could move your original stop loss level upwards to 10250, locking in a profit of at least £650 (10250-10120 x £5) while still allow your trade room to run into potentially additional gains. Should the index continue to rise, you could keep moving your stop loss upwards to lock in an even greater gain. One question about stop loss orders please – if the price is currently being quoted 5246 – 5248 and you say, place a stop loss at 5166, does that limit profits or does this only serve to put a limit on possible limits but not potential winnings? Yes, you are basically correct there. If you place a stop loss at 5166 you could suffer a maximum 82 point loss while your potential winnings could amount to hundreds, if not thousands of points… No capping on possible gains unless you place a limit ‘take profit’ order or close the position yourself. Is it possible to lose more than your account balance even with stops? In general during the trading day, the provider will be checking your margin on a constant basis, i.e. the amount of unencumbered funds in your trading account. If this falls below a certain percentage level as your position moves into the red, even if there are still some extra funds in reserve, you may find that the provider will contact you asking you to either put more funds in the account or cut the position by their own initiative. This should help protect you against losing an amount much in excess of your account balance but obviously you can’t trade your way out of trouble without putting some extra funds. As well as requesting additional margin funds, your provider is likely to cancel any pending new position orders as this would only aggravate your situation if they were triggered. Spread betting providers aren’t evil but they aren’t charitable institutions either and they have to make a profit… If starting out definitely use stops. Particularly at the beginning stops are your best friends! The stop system not only teaches you discipline but you also learn and develop your trading style and technique by winning AND losing! Do providers set restrictions on stop orders? In the actual market you can set stop levels wherever you wish, but some spread betting firms enforce minimum stop distances. For example, IG Index used to insist on a minimum stop distance of 2 points on the mini S&P market. Of course different brokers have different policies. Note: One common mistake that beginner spread betters tend to fall for is to run losses. In practice this means that when a spread bet is still open but losing money, the investor lets losses build up as the market keeps moving further and further against them in the hope that things will eventually turn round. This is a losing strategy but it is human nature not to want to suffer a loss. Too often, investors are satisfied to run large losses and take on small profits should the position come back into profit. Ensuring that losses are kept small and profit targets at least exceed the risk an investor is willing to take is key to ensuring not to fall into this trap.